Form and Function. The signature Oxbō lobby has it all. High ceilings and thoughtful details like hand-blown glass light fixtures create the ultimate first impression. Design Architect: Elness Swenson Graham Architects, Inc.
As one of the Midwest’s most iconic downtowns—rich in culture, commerce and community—Saint Paul is experiencing a renaissance, including the redevelopment of the city’s treasured Seven Corners neighborhood. In 2014, Seven Corners Hardware, a cornerstone of the neighborhood, decided to close its doors. Recognizing the potential of the site—its location near the Xcel Energy Center, the Ordway Center for the Performing Arts and more, and the feel and history of the neighborhood—Opus shared its vision for a reimagined Seven Corners with the city of Saint Paul. Seven Corners’ next chapter needed high-density mixed-use development, lively pedestrian activity and thoughtful planning to showcase all the city had to offer. One year later, Opus broke ground, and a six-story, mixed-use luxury apartment and retail development opened in spring 2017. 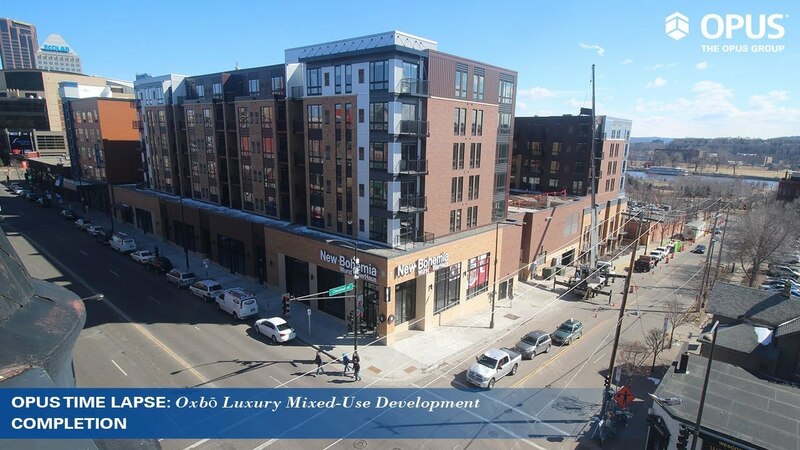 Named Oxbō, referencing the u-shaped bend in the Mississippi River as it flows through downtown Saint Paul, the development includes 191 new residential units—a combination of studio, one- and two-bedroom apartments and three-bedroom, townhouse-style residences. High-end amenities, including an outdoor courtyard featuring a pool, hot tub, fire pit and grill areas and a roof-level patio and club room with river views, fills a need by bringing luxury living back to downtown Saint Paul. The luxury building also features a fitness room and a club room with a Speakeasy whiskey lounge. The club room, the Speakeasy and other amenity spaces showcase the culture and history of Saint Paul and greater Minnesota with artwork and other decorative accents. From the project’s inception, collaboration with community members and city officials has ensured the development meets the needs of the neighborhood both aesthetically and functionally. Enhancing the neighborhood’s pedestrian activity and commerce, the building features 11,500 square feet of fully-leased, ground-level retail space. New Bohemia, a craft beer hall known for its sausages and local beer selection, opened in January 2017. The design of the exterior presents a good balance between the modern architecture of the Xcel Energy Center and the historic feel of the Irvine Park neighborhood. With the first renters being welcomed in March 2017, nearly 45% of units were leased upon completion in May 2017. Through strong collaboration with the city, community members and business leaders, Opus is contributing to the continued growth of downtown Saint Paul.